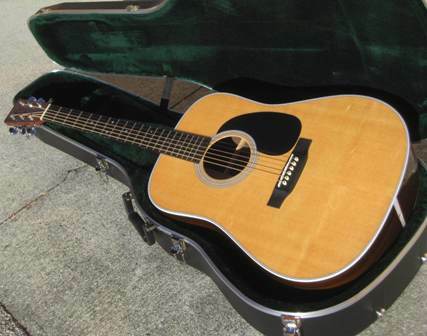 Today we are looking at a guitar that never stood a chance in my collection, a 2012 Martin D-28 acoustic. This is no fault of the guitar, but is it an innocent bystander of my fickle nature. It is still a beautiful dreadnought that anyone in their right mind would be glad to possess. 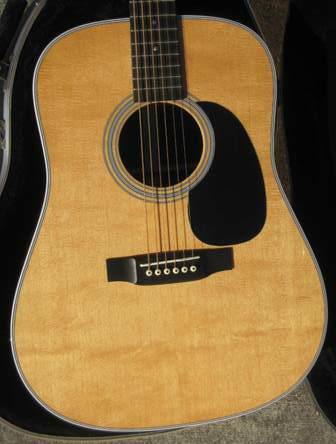 The D-28 is a classic in the Martin line, and it was put into production shortly after the D- series was introduced in 1931. This guitar hit the market at exactly the right time, and its full range and sweet tone were just what the performers of the day were looking for. As time went on, this became the signature model in the company’s line-up and it became the guitar of choice of for musicians from all genres, including legends such as George Jones, Hank Williams and Elvis Presley. There were a few cosmetic changes to this model over the years, and some structural and functional changes including a slimmer neck and better internal bracing. The 2012 Martin D-28 we are looking at today represents the zenith of this guitar’s development, and it is a solid piece of work. On initial inspection the D028 does not look super fancy, but it is still a very handsome instrument. The solid sitka spruce top has a nice grain, and fortunately it is not as blindingly white as some new Martin guitars I have seen. 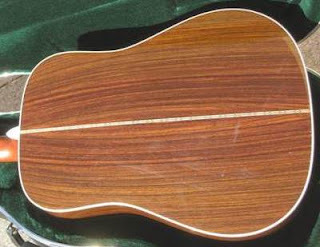 The sides and back are made from pretty solid East Indian rosewood. The body has multi-layer black and white binding, which looks very nice. It carries over to the purfling on the back. The black pickguard and the rosette are not my favorite look, but it they are well accomplished. The neck is a fine piece of workmanship. It is made of satin-finished hand-shaped mahogany with an ebony fretboard (the bridge base is ebony too). 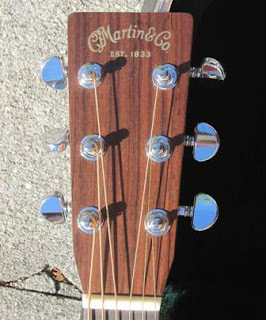 The neck is not bound, and 14 of its 20 frets are clear of the body, which is a change that Martin made in 1934. 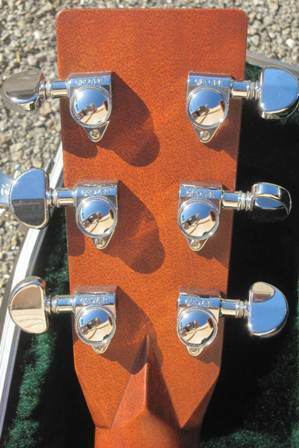 The neck has an easy and shallow profile, with a 16-inch radius and a 1 11/16-inch wide nut. The nut and compensated bridge are both made of bone. Grover tuners are installed at the factory, and they hold well but I am not sure that they really fit into the look and character of the instrument. There is no electronics on this one, but supposedly there is one available. The $95 K&K Pure Mini is a nice choice for these, if you want to plug in. These guitars are fantastic, but not terribly cheap. A brand new Martin D-28 has a list price of $2799 and a street price of $2399, which includes a nice molded hard case and a limited lifetime warranty for the original purchaser. Think of it as an investment in your future, as these guitars will last a lifetime if kept in a loving environment. By the way, a while back I went on the Martin factory tour and got to see first-hand the care that goes into building these guitars, and it made me proud to own one. If you are ever in Eastern Pennsylvania, I highly recommend that you stop by their factory for a tour. Unfortunately for this D-28, the week after I picked this one up I stumbled across a D-18 Golden Era, and the its Adirondack top distracted me so much that I had to off this one in a big hurry. So, this guitar moved on to a fellow in San Diego, and he loves it to death. Good to know it went to a nice home. I have handled, played, and repaired Martins dating from 1860 to brand new models. There are some obvious shortcuts that have taken place, due to either new construction techniques, environmental concerns with wood species, or the bean counters shaving off a few minutes here and there to get the bottom line tidier. 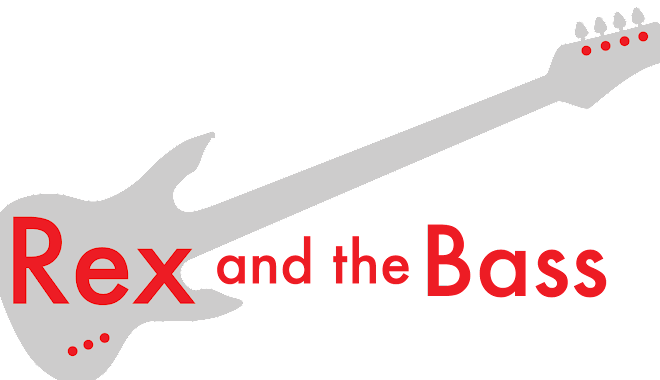 That said, very few of them were bad guitars, and more than a few of them were great -or potentially great- ones. I still remember taking a 1937 D-28 for a spin in Seattle six years ago, it was that good.